The Panda Bear hamster is an adorable relative of the Syrian hamster, which is most well-known for its distinctive fur coloration. 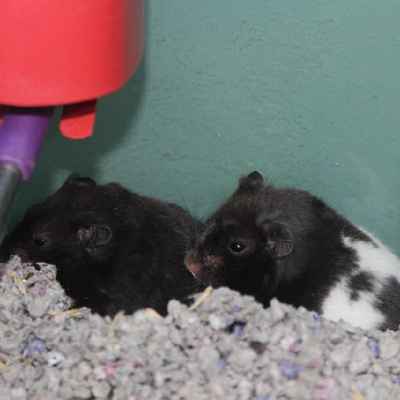 Technically, Panda Bear hamsters are simply Syrian hamsters that have been selected for their black and white coats. As their name suggests, the Panda Bear hamster is named due to the fact that its coloring is similar to that of a panda bear. The Panda Bear hamster is not typically seen as being very sociable with humans. In fact, it could be said that Panda Bear hamsters actually prefer solitude to the company of humans. With this in mind, it’s best to exercise caution when handling a Panda Bear hamster. Panda Bear hamsters may bite if startled, especially if they are awoken while sleeping. Never disturb your Panda Bear hamster when they are resting, since this can cause them to become irritable and aggressive. However, it is still possible to share a loving and gentle relationship with your Panda Bear hamster, as long as you respect their need for occasional solitude. Panda Bear hamsters are very curious and active animals. Because of this, it’s important to keep your Panda Bear hamster entertained while they are in their cage. Panda Bear hamsters love interactive toys, tasty treats and a variety of chew toys. In addition to this, it’s also highly recommended that you place a sturdy exercise wheel inside the cage of your Panda Bear hamster.